First: I am overwhelmed by the number of kind comments on last week’s post “What’s Next?” I can’t even begin to thank all of you who took the time to read it and then even more time to send me sweet notes on Facebook, Instagram, and on the blog itself. You give me hope knowing I’m not alone and I am grateful to all who let my words into their worlds. If you know me or read my blog, you know I struggle with the concept of God, and I’m not really sure why. 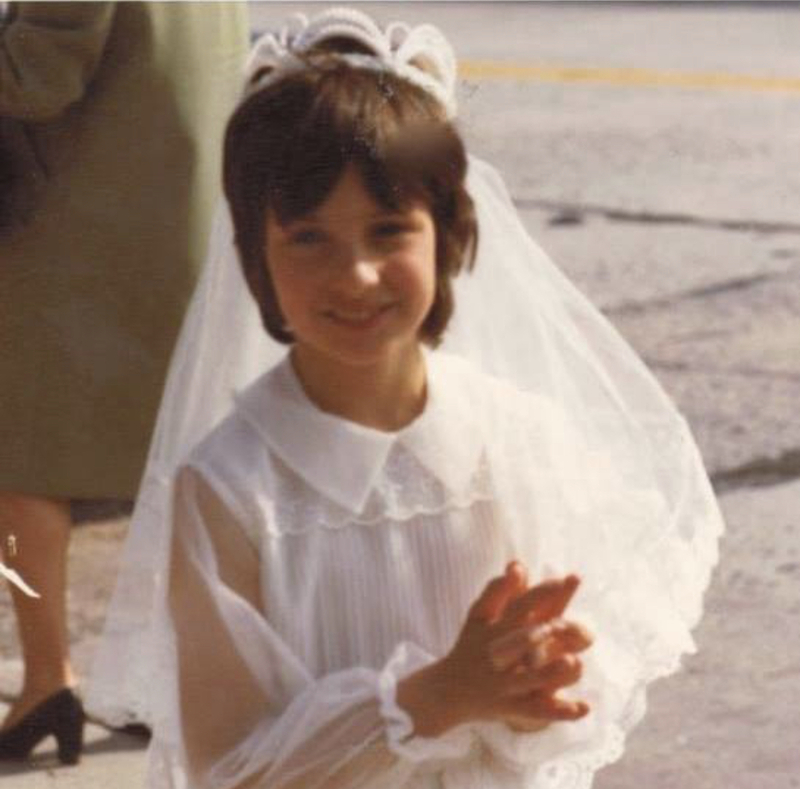 My early childhood was mainly dominated by Catholicism (yes, that’s me making my First Holy Communion) and then my mother went on a “spiritual journey,” it was the 70’s so it all made complete sense. She shopped churches like you shop grocery stores for the best discounts. If you ask my dear mother, she will tell you the story about her knocking on the convent doors asking the nuns questions they did not want to hear or answer. She would move onto the next church/religion and asked those same hard questions. Here was this thirty-two-year-old woman with three girls 10, 9, and 7. She was in a bad marriage. It was an awful marriage, consumed with drugs, alcohol and devil worship, so it’s not surprising at all that she set out to find some calm, some order, and some peace. I have vague memories of being a ten year old looking at my beautiful mom dressed in a yellow sari. Her olive skin tone made the yellow glow like she was a devis (Sanskrit for “goddess”). Because I was only ten years old, I have memories that are more like snapshots, pictures, than actual memories. I have one image in my mind of my mom in that yellow sari, loading my two sisters and me into our Ford Pinto and driving for what seemed like hours. I’m sure it wasn’t hours, but it was far, and as I watched Long Island drift into the distance, I remember wondering, where we were going and how I wished my best friend Kelly Carroll was with me, not my two sisters. After what seemed like a lifetime, I remember a large field with a lot of people, all dressed like my mom, but in my opinion, not near as beautiful. Where we were, I can’t remember. What we did, I only remember it being like a giant picnic. I don’t remember driving home or ever seeing my mom in a sari again. We didn’t become Hindu in 1977 or ever, but that memory sticks in my mind and now at 52, I understand more than ever my mother’s spiritual journey. “Do you drive your car?” He said. “Does someone pay you to drive your car?” He said. “No,” I said, again looking at him like he was nuts. “Then you’re not a driver?” He said. It was obvious, just because someone doesn’t pay me to write, doesn’t mean I’m not a writer. I’m lucky enough to have a husband who lets me take the time every day to write or sit on the couch when I can’t find words and wait for them to show up, which they usually always do. This man touched my heart more than he will probably ever know and made me feel comfortable with the down quiet times that happen when you are a writer. So I’m going to keep writing, my answer will always be “writer” when people ask me what I do, and maybe, just maybe, my words will touch someone’s heart like his words touched mine. I immediately felt emotionally connected to this post. Your description of your Mom’s struggles and search really moved me. Even though we haven’t been personally connected for decades, your writing makes me feel as if we just spent an afternoon together. Please keep writing and sharing. There are days when I can close my eyes and it’s summer in Williston Park and we are playing in the street. It seems so real I can even hear the cicadas chirping. I’m glad you enjoyed the post, miss you, my friend! I’ve made at most a few hundred dollars writing and I’ve been at it for fifteen years. If I sell fifty copies of my first novel, I’ll consider it a success. I understand the self doubt, you feel and the wondering if what you are doing is the proper purpose for you. Hint, I’m sure it is. We Are creating art, taking pieces of ourselves and making something new out of it, so it can be easy second guess ourselves, attempt a “never mind” because what we do is a lot more personal than even we assume. I’m of the mind that as long as what you do makes your heart sing keep creating. The artist must first take delight in what they do for art to truly be beautiful. Being a writer is not unlike a birthing. Your mind pregnant with possibilities begins to weave and sew the little fingers, the little toes of your piece until finally it’s life is beating unapologetically. Keep doing what you love, create and weave…we are all masters of our path.